I am not a breakfast person. Never was. Which is probably a good thing, especially since the ankle biters came along, as I never seem to actually get any. I suppose it’s not entirely their fault. I possess a system that does not like to wake up for at least two hours after my feet hit the floor in the morning. My breakfast could very well be called brunch. Semantics. It’s all food no matter what way you eat it. But as it’s a breakfast post (is it?) in case I haven’t mentioned it 7 times already, I absolutely hate porridge or anything warm and milky. I am not even fond of cereal with a splash of cold milk. Eggs and bacon. Eggs on toast. Or just plain toast will do nicely, thank you for asking. I am, however, partial to a decent granola. Which is a bit odd as it consists primarily of oat flakes which are really porridge in disguise. Snobby porridge if you will. But I really really like the stuff. With some yogurt on top. But, in order to be deemed fit enough to be in my bowl, and you market yourself as Granola, then you must meet the following criteria. Actually be granola and not moos-lee. Chancers! None of your flour and sugar content thank you very much. Not too much dried fruit. And absolutely no raisins. Preferably wheat free therefore gluten free. I just like it like that. A daycent bag if you please. Generally granola costs a fiver. That’s a lotta money for sawdust and wood shavings. Even if they are tasty wood shavings. I’m not fussy, I just know what I like, okay? And another thing I’ve noticed is there are so many different varieties out there. I have yet to find the same bag the next time I go to the supermarket. I’ve been in three different places now and even in a different seaside county and they are all different. 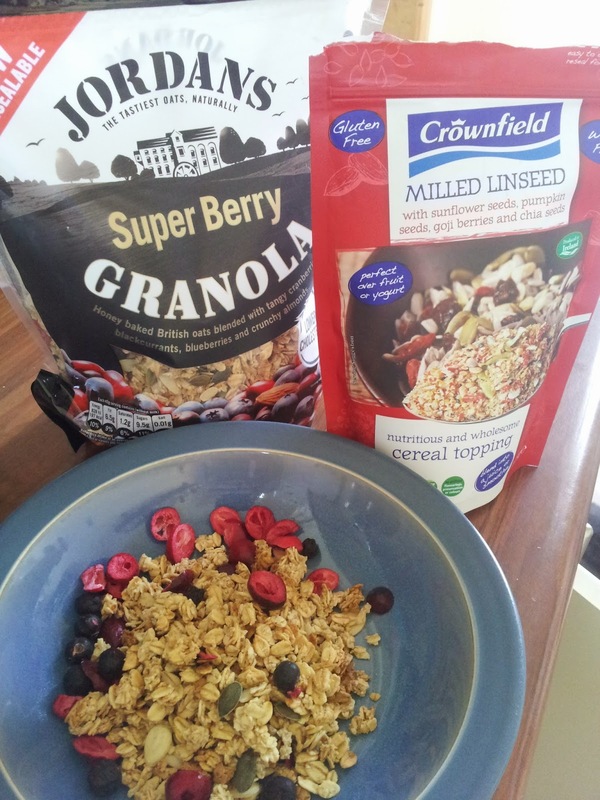 Currently I am enjoying Jordan’s Super Berry granola. If you’re interested/give a damn/like granola/bored/drunk/all of these/ the bags of Linseed from Lidl are gorgeous so put a generous couple of teaspoons through as well. Porridge is well lauded for its filling you up powers and it appears granola will do the same. I love a bowl after a run. Keeps me out of the sweetie tin. I’m sorry. Very sorry. It’s been a slow week.